Heat butter or oil in a skillet over medium-high heat. Add onion and red bell pepper and sauté until tender. Add potatoes and continue to sauté until slightly browned. Stir in beans and Organic Spicy Corn & Tomato Relish until heated. Season to taste with salt and pepper. Sprinkle cheese over the top. Method 1- Make four wells in the hash, exposing the bottom of the pan. Crack an egg in each well. Cover skillet with a lid and cook until eggs are done to your liking. Method 2- Fry eggs in a separate greased pan to your liking. 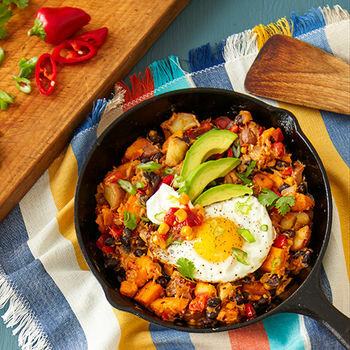 Place cooked eggs on top of the hash, garnish with cilantro and serve.